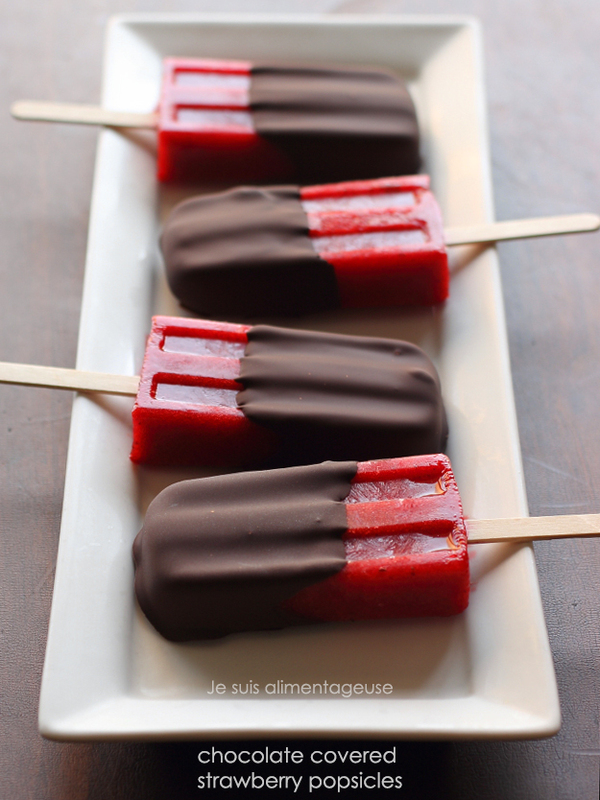 Chocolate covered strawberry popsicles are perfect for a summer treat! Chocolate covered strawberries are probably my favourite dessertÂ ever. I always forgetÂ how much I love them untilÂ the option of having them for dessert presents itself, I want nothing more. I love the juicy pop of strawberry and the snap of dark chocolate asÂ as I take a bite. Back in my undergrad, I used to work for Edible Arrangements and I was primarily their chocolate dipper and I thought I’d get sick of them by now, but if anything, it’s made me love them more. I’ve dipped thousands and thousands of strawberries by now, and I fall in love with eachÂ perfect swirl from the tail of drizzled chocolate that’s twirledÂ around the berry. I love the look of them in a box in mini cupcake or candy wrappers, with that smooth chocolate sheen they get with good, tempered chocolate (BTW above, not properly tempered chocolate but I’m over it). I’m sure I could talk more about how it’s the end of strawberry season and it was fun to go strawberry picking and find plump, brightly hued berries a few weekends ago, but I feel like I should address something that’s affected me mildly for the past couple years, and even more severely in the past couple of weeks. Don’t get me wrong, I have friends. I have family. I have Chris even though we’ve spent the last two years apart. But it’s still there. Loneliness. But in theÂ past two years in Toronto, I’ve spent more time alone than I have in my entire life. My former roommate wasn’t home very much or she was constantly busy, Chris is busy being an engineering student and spending every waking hour studying, and my family lives in another city, and Toronto is so but that it takes at least a half hour commute to see any of my friends (and I can’t always afford the bus fare =/).Â I didn’t realize how much I needed people around me until nobody was around. To cope I watched hundreds of hours of TV shows, connecting to those characters and stories much more than I have ever done before. I was never bored, just alone. But you can be surrounded by people and still feel lonely. I find it happens the most when people simply just don’t understand me, what I’m going through, or my excitement about something. I feel lonely in Toronto when almost all my friends are either translators or musicians, and I am sadly neither, at least not enough to an extent to sympathize and connect with them on a professional level. I have a lot of friends who thought that while I was in school and working as a graduate assistant, my life was super fun because in my spare time, I’d be baking and taking pictures of food. Not that I’m saying being a food blogger is hard or that you need a fancy degree to do it or anything, it’s just that it’s a lot of work, and not everybody gets that. What I miss most I suppose is coming home at the end of the day and just sitting in silence with Chris. We share a funny story here and about what happened that day, but other than that, we don’t need words.Â I miss that. But while he’s still finishing school, I’m eternally grateful to have made the online connections I’ve had through blogging. Three years ago when I started JSA, I never would have expected people to ever care about what I write, photograph, or cook. It mostly started with Online Blog Conference, which I attended for two years and now am helping organize for the fall. They have laughed, supported, and encouraged me through all the comments, the lulls, the fails, and the successes. If you’d like the join the OBC community, I’m hosting a giveaway for one free ticket for the conference below! 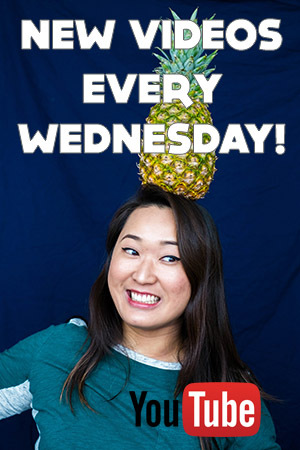 And if you don’t win, I highly encourage you to attend anyway, it’s only $50, you make such great connections, friendships, and my blog wouldn’t be anywhere near what it is today without their help. Yields 8 popsicles, depending on the size of your mould. Use a blender to purÃ©e the strawberries, lemon juice, and your choice of sweetener. Divide among popsicle moulds and freeze (mine took about 4 hours). 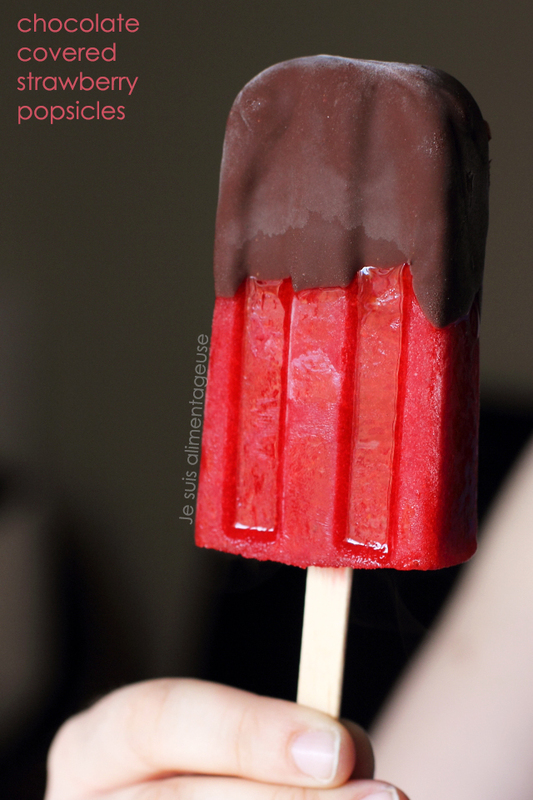 To make the chocolate coating, use a short and narrow glass that is wide enough for you to dip in your popsicles. If the glass is too wide and you'll have to spend time dunking both sides of the popsicle in and you may drop some melted strawberry purÃ©e in and cause the chocolate to seize. Microwave for about 30 seconds, stir well, then another 15 seconds (the chocolate chips may not look melted yet). Stir until chips are fully melted and let the chocolate cool until it's just barely warm, stirring occasionally. Release the popsicles from the mould and work quickly to dip them all in the chocolate before they start to melt. You may want to keep half of them in the freezer while you work with the first half to be safe. Dip them in the chocolate, shake off a little but of the excess, and place on a lined sheet. Pop them back in the freezer to set the chocolate. Enjoy! If you're not going to eat these within the next couple days, store them in an airtight container and separate the popsicles with parchment paper. This prevents them from freezer burn from sticking together. I totally miss co-worker drama sometimes haha. I'm so glad you're back to join us for year 3, Julie! Toronto is such an odd city: if you find your niche of people, it's a blast. Especially if you're not financially challenged like I am because life in TO is expensive. But unless you have close friends whom live close to you, it is pretty awful. I'm so glad you're happier now =) Underwear dancing (heck I naked dance) is always a good time. With the windows closed in Toronto anyway... y'know busy streets and all haha.Also I contemplated adding booze to these but when I was making the recipe I totally forgot haha. It'd probably make them less ice-crystal-y though.Thanks so much for taking the time to read and comment =) I'll keep you in mind if I ever feel lonely! Lisa, I totally understand how you're feeling. 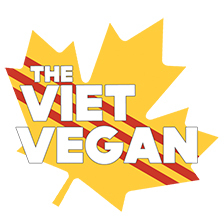 I'm from Toronto, but have been living in Vancouver for more than a decade. I love it here, but most of my family is in T.O. and even though I have my hubby, it's still hard. I also work from home, and it can be challenging to get out there and socialize with people, especially those who don't understand the food blogging/entrepreneurial life. There are no easy answers. Having an online community definitely helps, but I've also been reaching out to people who live in my neighbourhood as much as I can. I find actually picking up the phone and calling people helps too, not just texting or emailing.And your strawberry pops look delicious! Can't go wrong with anything dipped in chocolate, methinks. Wow that's amazing! I'm so glad you volunteer a lot, and a hockey manager? That sounds interesting! I volunteer for a couple places too to meet people and to have somewhat of a routine, but I'm glad you too understand the balance of working and having face-to-face people time (that sounds weird haha). Love the combination of chocolate and strawberries! Need to try these! It's super easy to make =) I hope you like it.